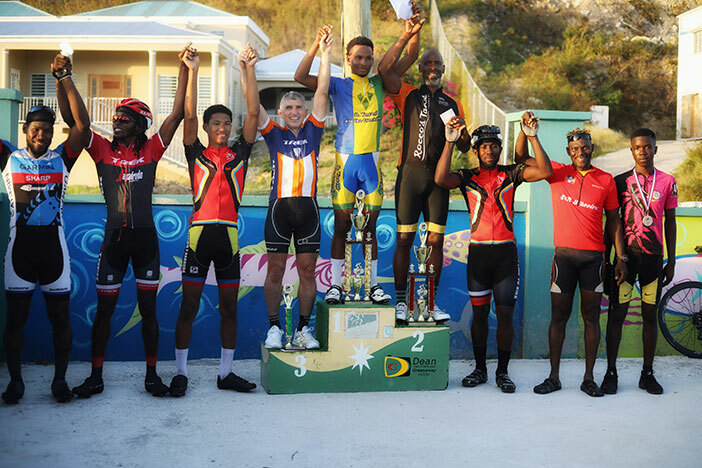 After winning both $50 sprint premes, St. Vincent and the Grenadines’ Trevor Bailey outsprinted his Antigua and Barbuda and BVI counterparts, to win Sunday’s BVI Cycling Federation 74 miles 13-laps Election Classic in West End and collected the $500 prize. Bailey, who won the 2018 Caribbean Cycling Championships, fended off the charge of Antigua and Barbuda’s Sean Weathered, the BVI’s Phillipe Leroy and Antigua and Barbuda’s Rena Gayral, to win in 3 hours, 57 minutes and 40 seconds to Weathered’s 3:57.45 and Leroy’s 3:57.47. Gayral placed fourth in 3:57.48. Bailey who will compete in the Dominican Republic as part of a Caribbean team in a 560 miles seven stage race this weekend, said he had a problem trying to break away after the elite field of eight split in half. He said the race needed some hills. Weathered, who earned $350 in for second place, said it was an enjoyable race and Bailey with whom he competed in the Caribbean Championships was his target, but he edged him at the end. With four of them over the last 20 miles, he said it was tough to break away on the last lap. He said Bailey’s strength would be the hills and since there were no hills, it was tough for him to get away. Weathered dedicated the race to his sponsor who has Multiple Sclerosis and said his heart went out to him. “My race today was dedicated to persons suffering with Multiple Sclerosis,” he said. BVI Cycling Federation president Darel Christopher Sr., said despite the small numbers and the absence of the Haitian rider, there was a great crowd watching the small field of riders. Final results: 1. Trevor Bailey, St. Vincent and the Grenadines, 3 hours, 57 minutes and 40 seconds. 2. Sean Weathered, Antigua and Barbuda, 3:57.45. 3. Phillipe Leroy, BVI, 3:57.47. 4. Rena Gayral, Antigua and Barbuda, 3:57.48. 5. Akeem Thomlinson, Antigua and Barbuda, 3:50.09 (11 laps). 6. Neli Lloyd, Antigua and Barbuda, 3:57.20 (11laps). 7. Bram Sanderson, Dominica, 4:02.28. 8. Orano Andrews, BVI, 3:50.09. (10 laps). Women: Kay Reddy, Olympia Fahie and Natasha Ruscheinski.